Google has habitually named new update after something sweet. Previously released Android versions were named Oreo, Nougat, Marshmallow, and lollipop. 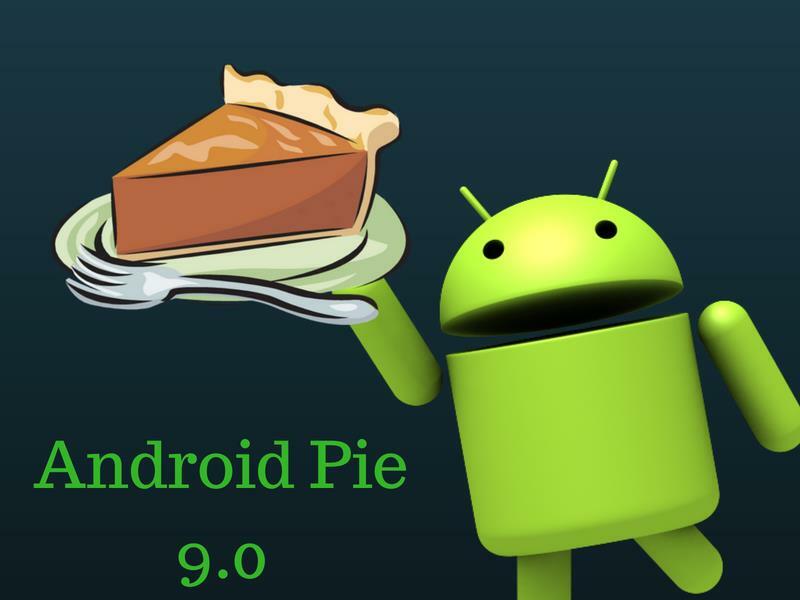 And today we have the Android 9 Pie. Google’s latest update entered first to the search giant’s Pixel smartphones starting Monday. Google has initially announced the preview version of the software in the month of March, then demoed some of features at its annual I/O developer conference. As we know that Android is the dominant player in the smart phone technology market, it powers 9 out of 10 mobiles. So, this time google chooses to give more focus on Digital Wellbeing by developing features and using more power of AI. The latest version will be smarter, fast and adaptive.The first version will be received by the Google Pixel and Pixel 2 devices with Android one smartphone. Those who sign up for the Android Beta program, Google will let them try out this pre-released version of this software, if they have devices from Sony, Xiaomi, HMD Global, Vivo, OnePlus and Essential. * Who will get the slice of the Andorid 9 Pie? We can go ahead with the information but, if you don’t know how to get the test of Pie then everything will feel meaningless. Most of users will get the update via a simple OTA update for Pixel phones. But, if you don’t want to wait till the time Google serves you then, you can manually flash it on your phone and get all the updates. Android 9 Pie mostly focuses on the behind-the-scenes improvements to work faster than before. With the latest update, Google believes that your phone intimacy should adopt your lifestyle. Android 9 has several features supported by the AI. The new features will change the way you use the phone. • This feature is suggestion and action based followed by use of the smartphone habits. If you have ordered food previous afternoon, today at the same time the drawer will automatically appear on your screen, and you can directly order the food from there. If you plug in your headphone, it will directly start playing song from your last play list. Basically, it will save few click actions to use the applications. • Adaptive Brightness: This feature focuses more on the background. The brightness will change the preferences based on your surroundings. Just to be handier it will automatically change to high or low as per your surroundings. • Adaptive Battery: Your battery usage varies from app to app. For some applications, you use more, but some of them there is only limited use. Adapter battery will give more power to the applications you use the most and limit the power use of the app which you use in limit. The traditional navigation button has been replaced by the small pill shaped icon at the bottom of the screen. Full swipe will open the drawer and by swiping right, you can get back to the last app you were using. If you tap the button you will go back to home and holding it will give you access to Google Assistant. The back button will still be functional if you were in other applications. Google maps are largely working for outside walking and driving the vehicle, but if you walk into the larger malls it will not work. The feature in Android 9 includes the support for “WI-Fi Round Trip Time” or RTT, which allows more indoor positioning in your apps.When the WI-Fi is enabled and on high accuracy you can use in-build navigation, fine-grained location-based services and location-based information, you get to know about the ongoing offer for product and services. While using the device you might get annoyed by the accidental screen rotation. If you have an update of the Android 9 Pie this will never happen in your device. You can pin a screen to the specified orientation through the navigation bar. When you are done with the screen simply tap the icon. In recent times, every phone comes with the dual camera. With the new android 9 it allows developers to stream simultaneously between two or more camera. In addition, features like Session parameters, helps to reduce the delay caused during the initial capture. Also surface sharing allows user to handle the camera without stopping or starting the camera streaming. This is our favourite part. Everyone loves to use the emoji’s, here we will see more than 100 new emojis in the updates. Emojis are largely based on the gender quality, including every skin tone and every type of hair color. If you would like to see the emoji types take a glimpse here. Android 9 will have the support of major Android runtime enhancement. This will allow apps to rewrite files by their own and execute the files on devices. This allows you to start faster and consume less disk space and RAM in your device. After the launch of iPhone X the notch is very demanding in the market. We have seen that the number of Android devices are coming out with the Notch. Android Pie will change the way it offers the display cut out support. 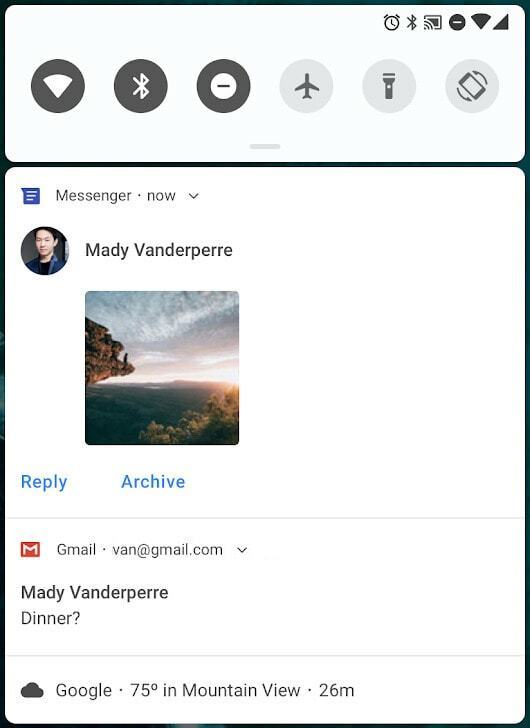 While getting the notifications for messages, now you can reply directly from the notification. With the help of smart reply. You can send text instantly from notification bar. The notification will look little different with a new font and clear design. Also, you can block the entire group of conversation within the notification setting. Android Pie comes with the Android protected confirmation which is the most exciting feature from all the features. It has a number of options to make your phone more secure. Android 9 will perform the client-side encryption, if any, data encryption or disruption will happen, it will ask for the authentication from your phone. Google will get all the information in the cloud, so hackers or any third parties could not get any data from the computers. It will also give unified authentic biometric dealings on behalf of your app. It will be powered by the adaptive changes chosen by the user. Your devices have a unique MAC address with the network Android 9 which allows to user to create randomize Mac address for each network effort and the address will not continue to change with the time. If you have a Pixel phone, you are soon getting all the over-the-air updates rolling out today. Tell us in the comment section if have experienced this feature in your pixel phones. Next PostNext 10 Points You Can’t Ignore While Hiring the Best iPhone/iOS Application Developer!